An icon (from Greek εἰκών, eikon, "image") is a religious image or representation of an object, deity or sacred figure or event. Originally, in Greek, "eikon" denoted an artistic depiction of an object without the necessity of sanctity or veneration. With the passage of time, however, icons became popular religious tools, used within the Christian traditions of Eastern Orthodoxy, to evoke veneration and to educate the masses. Icons are most widely used in Orthodox Churches. They are generally flat panel paintings depicting a holy person or object such as Jesus, Mary, saints, angels, or the cross. Other religions such as Hinduism also make use of icons (known as Murtis), which may be cast in metal or carved in stone. In modern popular culture, the word 'icon' is used in the general sense of symbol — i.e., a name, face, picture, edifice or even a person readily recognized as having some well-known significance or embodying certain qualities. Throughout history, various religions have made use of icons in their religious practice. Some, such as Hinduism, have a very rich iconography, while others, such as Islam, severely limit the use of visual representations. The function and degree to which icons are used or permitted, and whether they are for purposes of ornament, instruction, inspiration, or treated as sacred objects of veneration or worship, thus depends upon the tenets of a given religion. Consequently, icons have served a variety of roles: They have been used to evoke wonder, veneration, inspiration and praise among devotees. In most of the history of Christendom and Hinduism, icons have also served as tools of edification for the faithful when most could not read nor write. In some cultures, it has been customary to illuminate icons with candles, and to see them as channels or gateways to the divine (see Murti). In Eastern Orthodoxy, it is not uncommon for specific icons to be characterised as "miraculous," given particular names (especially those of the Virgin Mary), and even toured from city to city where believers amass to venerate them. Islands like that of Tinos are renowned for possessing such "miraculous" icons, and are visited every year by thousands of believers, with the purpose of petitioning these icons. Most Orthodox Christians kiss religious icons upon entering the Church up to this day, and some miraculous icons are said to exude fragrant, healing oils, or perform miracles upon petition by the believers. Such miracles are understood as performed by God through the prayers of the saint, rather than being magical properties of the painted wood itself. According to Eastern Orthodoxy, any praise and veneration shown to an icon passes over to the archetype (Basil of Caesarea, On the Holy Spirit 18:45). Thus to kiss an icon of Christ, in the Eastern Orthodox view, is to show love towards Christ Jesus himself, not to adore the mere wood and paint making up the physical substance of the icon. Worship of the icon as somehow entirely separate from its prototype is expressly forbidden by the Seventh Ecumenical Council; standard teaching in the Eastern Orthodox and Roman Catholic churches alike conforms to this principle. The Catholic Church accepts the same Councils and the canons therein that codified the teaching of icon veneration. The Latin Church of the West, which after 1054 was to become separate as the Roman Catholic Church, accepted the decrees of the iconodule Seventh Ecumenical Council regarding images. There is some minor difference, however, in the Catholic attitude to images from that of the Orthodox. Following Gregory the Great, Catholics emphasize the role of images as the Biblia Pauperum, the “Bible of the Poor,” from which those who could not read could nonetheless learn. This view of images as educational is shared by most Protestants. Catholics have also traditionally favored images in the form of three-dimensional statuary, whereas in the East statuary is much less widely employed. In Christian scripture, the word "eikon" is used in a variety of ways. The Septuagint (Greek translation of the Hebrew Scriptures) uses eikon to denote everything from man being made in the divine image to the "molten idol" placed by Manasses in the Temple. In the New Testament, the term Eikon is correspondingly used for diverse topics from Jesus as the image of the invisible God (Colossians 1:15) to the image of Caesar on a Roman coin (Matthew 22:20) to the image of the Beast in the Apocalypse (Revelation 14:19). "The first thing to note is that there is a total silence about Christian and non-idolatrous images. … So, if we want to find out if the first Christians made or ordered any kind of figurative art, the New Testament is of no use whatsoever. The silence is a fact, but the reason given for the silence varies from exegete to exeget depending on his assumptions (Early Christian Attitudes Toward Images, Orthodox Research Institute, 2004)." In other words, relying only upon the New Testament as evidence of no painted icons amounts to an argument from silence. Early Christian art and paintings can be found in the catacomb churches. Many can still be viewed today, such as those in the catacomb churches of Domitilla and San Callisto in Rome. "They also possess images, some of them painted, and others formed from different kinds of material; while they maintain that a likeness of Christ was made by Pilate at that time when Jesus lived among them. They crown these images, and set them up along with the images of the philosophers of the world that is to say, with the images of Pythagoras, and Plato, and Aristotle, and the rest. They have also other modes of honouring these images, after the same manner of the Gentiles [pagans]." " …he [John] went into the bedchamber, and saw the portrait of an old man crowned with garlands, and lamps and altars set before it. And he called him and said: Lycomedes, what do you mean by this matter of the portrait? Can it be one of thy gods that is painted here? For I see that you are still living in heathen fashion,” Later in the passage John says, "But this that you have now done is childish and imperfect: you have drawn a dead likeness of the dead (27)." The fourth century C.E. bishop Eusebius, in his Church History, provides another reference to a “first” icon of Jesus. He relates that King Abgar of Edessa sent a letter to Jesus at Jerusalem, asking Jesus to come and heal him of an illness. In this version there is no image. Then, in the later account found in the Syriac Doctrine of Addai, a painted image of Jesus is mentioned in the story; and even later, in the account given by Evagrius, the painted image is transformed into an image that miraculously appeared on a towel when Christ pressed the cloth to his wet face (Kuryluk, 1991). Further legends relate that the cloth remained in Edessa until the tenth century, when it was taken to Constantinople. In 1204 it was lost when Constantinople was sacked by Crusaders. Elsewhere in his Church History, Eusebius reports seeing what he took to be portraits of Jesus, Peter and Paul, and also mentions a bronze statue at Banias / Paneas, of which he wrote, "They say that this statue is an image of Jesus" (H.E. 7:18); further, he relates that locals thought the image to be a memorial of the healing of the woman with an issue of blood by Jesus (Luke 8:43-48), because it depicted a standing man wearing a double cloak and with arm outstretched, and a woman kneeling before him with arms reaching out as if in supplication. Some scholars today think it possible to have been a misidentified pagan statue whose true identity had been forgotten; some have thought it to be Aesculapius, the God of healing, but the description of the standing figure and the woman kneeling in supplication is precisely that found on coins depicting the bearded emperor Hadrian reaching out to a female figure symbolizing a province kneeling before him (Wilson, 2004). When Christianity was legalized by the emperor Constantine within the Roman Empire in the early fourth century, huge numbers of pagans became converts. This created the opportunity for the transfer of allegiance and practice from the old gods and heroes to the new religion, and for the gradual adaptation of the old system of image making and veneration to a Christian context. "By the early fifth century, we know of the ownership of private icons of saints; by c. 480-500, we can be sure that the inside of a saint's shrine would be adorned with images and votive portraits, a practice which had probably begun earlier" (Fox, 1989). Christ and Saint Mina. 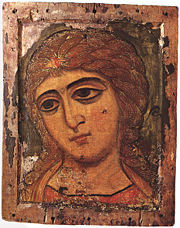 A sixth-century icon from Egypt (now in the Louvre). After the legalization of Christianity under Constantine, and its adoption as the Roman state religion under Theodosius I, Christian art began to change not only in quality and sophistication, but also in nature. This was in part due to Christians being free for the first time to express their faith openly without persecution from the state, in addition to the faith spreading to the wealthy segments of society, and paintings of martyrs and their feats began to appear. Nilus of Sinai, in his Letter to Heliodorus Silentiarius, records a miracle in which St. Plato of Ankyra appeared to a Christian in a dream. The Saint was recognized because the young man had often seen his portrait. This recognition of a religious figure from likeness to an image was also a characteristic of pagan pious accounts of appearances of gods to humans. However, in the Old Testament we read of prophets having dreams of various heavenly figures, including a vision of God who appeared to Daniel as an elderly man, the "Ancient of Days." 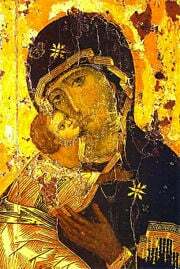 It is also in this period that the first mention of an image of Mary appears, though earlier paintings on cave walls bear resemblance to modern icons of Mary. Theodorus Lector, in the History of the Church 1:1 (excerpted by Nicephorus Callistus Xanthopoulos) stated that Eudokia (wife of Theodosius II, died 460) sent an image of “the Mother of God” from Jerusalem to Pulcheria, daughter of the Emperor Arcadius (this is by some considered a later interpolation). The image was specified to have been “painted by the Apostle Luke” (Jensen). In later tradition the number of icons of Mary attributed to Luke would greatly multiply. 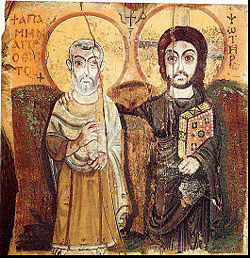 Early icons such as those preserved at the Monastery of St. Catherine at Sinai are realistic in appearance, in contrast to the later stylization. They are very similar to the mummy portraits done in encaustic wax and found at Faiyum in Egypt. As we may judge from such items, the first depictions of Jesus were generic rather than portrait images, generally representing him as a beardless young man. It was some time before the earliest examples of the long-haired, bearded face that was later to become standardized as the image of Jesus appeared. And when they began to appear there was still variation. Augustine of Hippo (354-430 C.E.) said that no one knew the appearance of Jesus or that of Mary (De Trinitatis 8:4-5), though it should be noted that Augustine was not a resident of the Holy Lands and therefore was not familiar with the local populations and their oral traditions. 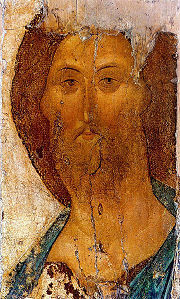 Gradually, paintings of Jesus took on characteristics of portrait images. 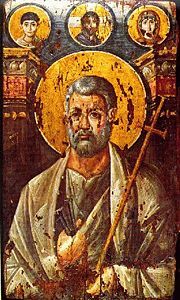 6th-century hot wax icon of Saint Peter, from Mount Sinai. At this time the manner of depicting Jesus was not yet uniform, and there was some controversy over which of the two most common forms was to be favored. The first or “Semitic” form showed Jesus with short and “frizzy” hair; the second showed a bearded Jesus with hair parted in the middle, the manner in which the god Zeus was depicted. Theodorus Lector remarked (History of the Church 1:15) that of the two, the one with short and frizzy hair was “more authentic.” He also relates a story (excerpted by John of Damascus) that a pagan commissioned to paint an image of Jesus used the “Zeus” form instead of the “Semitic” form, and that as punishment his hands withered. Though their development was gradual, we can date the full-blown appearance and general ecclesiastical (as opposed to simply popular or local) acceptance of Christian images as venerated and miracle-working objects to the sixth century (Belting, 1994). "… As we reach the second half of the sixth century, we find that images are attracting direct veneration and some of them are credited with the performance of miracles" (Karlin-Hayter, 2002). Cyril Mango writes, "In the post-Justinianic period the icon assumes an ever increasing role in popular devotion, and there is a proliferation of miracle stories connected with icons, some of them rather shocking to our eyes" (Mango, 1986). However, the earlier references by Eusebius and Irenaeus indicate veneration of images and reported miracles associated with them as early as the second century. It must also be noted that what might be shocking to our contemporary eyes may not have been viewed as such by the early Christians. In Acts 5:15 of the New Testament, it is written that "people brought the sick into the streets and laid them on beds and mats so that at least Peter's shadow might fall on some of them as he passed by." Angel the Golden Locks, a 1twelfh-century icon from Novgorod. There was a continuing opposition to misuse of images within Christianity from very early times. "Whenever images threatened to gain undue influence within the church, theologians have sought to strip them of their power" (Belting, 1994). Further,"there is no century between the fourth and the eighth in which there is not some evidence of opposition to images even within the Church" (Kitzinger, 1954; repeated by Pelikan, 1974). Nonetheless, the popularity of icons among the masses guaranteed their continued existence, while no systematic apologia for or against icons, or doctrinal authorization or condemnation of icons yet existed. The use of icons was seriously challenged by Byzantine Imperial authority in the 8th century. Though by this time opposition to images was strongly entrenched in Judaism and in the rising religion of Islam, attribution of the impetus toward an iconoclastic movement in Eastern Orthodoxy to Muslims or Jews "seems to have been highly exaggerated, both by contemporaries and by modern scholars" (Pelikan, 1974). The Iconoclastic Period began when images were banned by Emperor Leo III sometime between 726 and 730 C.E. Under his son Constantine V, an ecumenical council forbidding image veneration was held at Hieria near Constantinople in 754 C.E. Image veneration was later reinstated by the Empress Regent Irene, under whom another ecumenical council was held reversing the decisions of the previous iconoclast council and taking its title as Seventh Ecumenical Council. The council anathemized all who hold to iconoclasm, i.e. those who held that veneration of images constitutes idolatry. Then the ban was enforced again by Leo V in 815 C.E. Finally, icon veneration was decisively restored by Empress Regent Theodora. 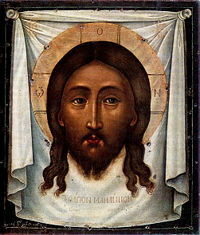 Icons became particularly popular among Eastern Orthodox, Oriental Orthodox, Coptic and Eastern Rite Catholic Churches. In Eastern Orthodoxy and other icon-painting Christian traditions, the icon is generally a flat panel painting depicting a holy being or object such as Jesus, Mary, saints, angels, or the cross. Icons may also be cast in metal, carved in stone, embroidered on cloth, done in mosaic work, printed on paper or metal, etc. The icon painting tradition developed in Byzantium, with Constantinople as the chief city. We have only a few icons from the eleventh century and no icons dating from the two centuries that preceded it, firstly because of the Iconoclastic reforms during which many were destroyed, secondly because of plundering by Venetians in 1204 during the Crusades, and finally the taking of the city by the Islamic Turks in 1453. It was only in the Comnenian period (1081-1185 C.E.) that the cult of the icon became widespread in the Byzantine world, partly on account of the dearth of richer materials (such as mosaics, ivory, and enamels), but also because a special screen for icons was introduced in ecclesiastical practice. The painting style of the time was severe, hieratic and distant. In the late Comnenian period this severity softened, and emotion, formerly avoided, entered icon painting. Major monuments for this change include the murals at Daphni (ca. 1100) and Nerezi near Skopje (1164). The Theotokos of Vladimir (ca. 1115, illustrated above) is probably the most representative monument to the new trend towards spirituality and emotion. The tendency toward emotionalism in icons continued in the Paleologan Period, which began in 1261. Paleologan art reached its pinnacle in mosaics such as those of the Kariye Camii (former Chora Monastery). In the last half of the 1300s, Paleologan saints were painted in an exaggerated manner, very slim and in contorted positions, that is, in a style known as the Paleologan Mannerism, of which Ochrid's Annunciation is a superb example. After the fall of Constantinople to the Turks in 1453, the Byzantine tradition was carried on in regions previously influenced by its religion and culture—the Balkans and Russia, Georgia, and in the Greek-speaking realm, on Crete. Crete, at that time, was under Venetian control and became a thriving center of art of the Scuola di San Luca, the "School of Saint Luke," an organized guild of painters. Cretan painting was heavily patronized both by Catholics of Venetian territories and by Eastern Orthodox. For ease of transport, Cretan iconographers specialized in panel paintings, and developed the ability to work in many styles to fit the taste of various patrons. In 1669 the city of Heraklion, on Crete, which at one time boasted at least 120 painters, finally fell to the Turks, and from that time Greek icon painting went into a decline, with a revival attempted in the twentieth century by art reformers such as Photios Kontoglou, who emphasized a return to earlier styles. a clear understanding of the importance of Icons" was part of the church from its very beginning, and has never changed, although explanations of their importance may have developed over time. This is due to the fact that iconography is rooted in the theology of the Incarnation (Christ being the eikon of God) which did not change, though its subsequent clarification within the Church occurred over the period of the first seven Ecumenical Councils (Ouspensky, 1978). Eastern Orthodox find the first instance of an image or icon in the Bible when God made man in His own image (Septuagint Greek eikona), recorded in Genesis 1:26-27. In Exodus, God commanded that the Israelites not make any graven image; but soon afterwards, he commanded that they make graven images of cherubim and other like things, both as statues and woven on tapestries. Later, Solomon included still more such imagery when he built the first temple. Eastern Orthodox believe these qualify as icons, in that they were visible images depicting heavenly beings and, in the case of the cherubim, used to indirectly indicate God's presence above the Ark. In Book of Numbers it is written that God told Moses to make a bronze serpent and hold it up, so that anyone looking at the snake would be healed of their snakebites. In John 3, Jesus refers to the same serpent, saying that he must be lifted up in the same way that the serpent was. John of Damascus also regarded the brazen serpent as an icon. Further, Jesus Christ himself is called the "image of the invisible God" in Colossians 1:15, and is therefore in one sense an icon. As people are also made in God's images, people are also considered to be living icons, and are therefore "censed" along with painted icons during Orthodox prayer services. Russian icons are typically paintings on wood, often small, though some in churches and monasteries may be as large as a table top. Many religious homes in Russia have icons hanging on the wall in the krasny ugol, the "red" or "beautiful" corner. There is a rich history and elaborate religious symbolism associated with icons. In Russian churches, the nave is typically separated from the sanctuary by an iconostasis (Russian ikonostás) a wall of icons. The use and making of icons entered Kievan Rus' (which later expanded to become the Russian Empire) following its conversion to Orthodox Christianity from the Eastern Roman (Byzantine) Empire in 988 C.E. As a general rule, these icons strictly followed models and formulas hallowed by usage, some of which had originated in Constantinople. As time passed, the Russians - notably Andrei Rublev (see image to the right) and Dionisius - widened the vocabulary of types and styles far beyond anything found elsewhere. The personal, improvisatory and creative traditions of Western European religious art are largely lacking in Russia before the seventeenth century, when Simon Ushakov's painting became strongly influenced by religious art and engravings from both Protestant and Catholic Europe. In the mid-seventeenth century changes in liturgy and practice instituted by Patriarch Nikon resulted in a split in the Russian Orthodox Church. The traditionalists, the persecuted "Old Ritualists" or Old Believers," continued the traditional stylization of icons, while the State Church modified its practice. From that time icons began to be painted not only in the traditional stylized and nonrealistic mode, but also in a mixture of Russian stylization and Western European realism, and in a Western European manner very much like that of Catholic religious art of the time. The Stroganov movement and the icons from Nevyansk rank among the last important schools of Russian icon-painting. The abundant use and veneration of images in the Roman Catholic Church was a point of contention for Protestant reformers, who varied in their attitudes toward images. In the consequent religious debates many statues were removed from churches, and there was also the destruction of images in some cases. Today, attitudes toward icons vary from church to church. Eastern Orthodoxy continues to give strong importance to the use and veneration of icons, so much so that they are often seen as the chief symbol of Orthodoxy. Roman Catholicism has a long tradition of valuing the arts and has patronized a significant number of famous artists. In the 1960s, the Second Vatican Council, however, declared that the use of statues and pictures in Roman Catholic churches should be moderate, and most statuary was removed from many Catholic Churches. Present-day imagery within Roman Catholicism varies in style from traditional to modern, and is often affected by trends in the art world in general. Protestants generally use religious art for teaching and for inspiration, but many Protestant church sanctuaries contain no imagery at all. Rather than the crucifix, Protestant Churches prefer to display the sign of the empty cross, which signifies Jesus' resurrection, the ultimate spiritual victory over the suffering and pain of the crucified savior, that expresses more the human side of Jesus. Kitzinger, Ernst. The Cult of Images in the Age before Iconoclasm. Dumbarton Oaks, 1954. Lampridius, Life of Alexander Severus xxix. Mango, Cyril. The Art of the Byzantine Empire 312-1453. University of Toronto Press, 1986. All links retrieved February 19, 2018. Hieromonk [now Bishop] Auxentios The Iconic and Symbolic in Orthodox Iconography.Orthodox Information Center. Adrian Fortescue Catholic Encyclopedia:"Veneration of Images" The Catholic Encyclopedia, Volume VII. Published 1910. New York: Robert Appleton Company. This page was last modified on 19 February 2018, at 18:03.